It is one of the most renowned street celebrations in Europe, The Carnival of Viareggio famous for its parades of huge floats. Each year over 600,000 people pack the streets of the Tuscany town which has hosted the event for 144 years and has become known for its political satire. It is a month of day and night festivities with parades, parties and masked balls. But underlying the events is a competition between all the floats and masquerades, and at stake are the honour and livelihoods of many people. The main raw material of the carnival is papier-mâché which was first used in 1925. 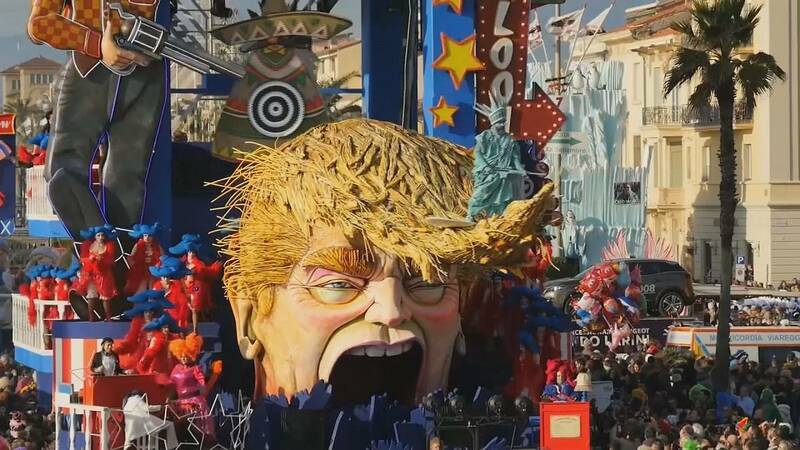 This year one float depicts President Donald Trump’s hair as a huge wave being surfed by the Statue of Liberty while a cowboy shoots down Mexicans and Muslims. It’s called ‘Big Bang’. Stefano Cinquini is the man behind “Big Bang”. “The idea stemmed from Donald Trump’s forelock, this peculiar shape that made us think of a wave, the new wave of American politics. From there we moved to a much more important and stronger topic, that is the use of guns,” he explained. Each year the craftsmen present the drafts of their float or mask to the Foundation, which chooses those who will take part in the next year’s carnival. Once their draft has been accepted, they begin working in the hangars. Building one of the floats in the main category can take up to five or six months. Dozens of men and women spend weeks painting, shaping and crafting each individual sculpture. Sending a message to citizens and politicians a like has driven Alessandro Avanzini, who built a float that depicted the European migration crisis. “The title of the float is ‘Frontiers’, and it deals with a highly topical subject, that is the migration of people fleeing from poverty, wars and many other things. I chose this subject because as a communicator working for the Carnival I have to breach topics that can be shared by the audience. And I think this is a theme many people have to confront,” he pointed out. Nowadays political satire is the backbone of the Carnival of Viareggio, but this was not always the case. Satire was first introduced in the 1960’s. Before that the carnival used to focus on topics related to the area, the sea or to nature. All of the artworks except for parts of the winning float, will be destroyed after a few months. Their components are then recovered and recycled. The final when the winning float will be announced takes place this year on March 5.